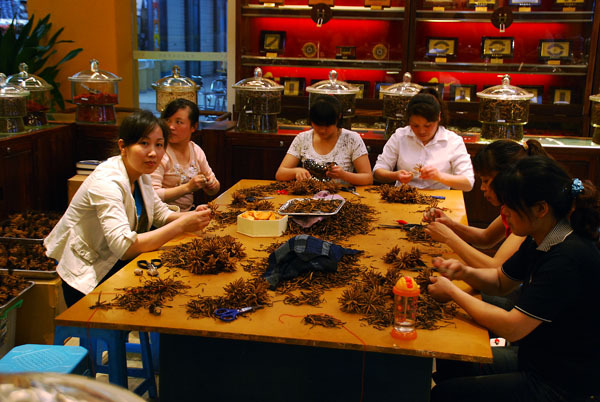 National Geographic Magazine ran an article solely dedicated to Yartsa Gunbu - Ophiocordyceps sinensis in their August 2012 edition entitled “Tibetan Gold - a medicinal fungus highly prized in China is fueling a boom on the Tibetan Plateau”. The six pages of text were written by Michael Finkel; the seven photos, including four double-page spreads, were taken by Michael Yamashita. Both Michaels have had several NGM assignments before. Also included was a graphic depiction of the life cycle of Ophiocordyceps sinensis and a distribution map. I probably better disclose at this point that I was contacted in February by the editors to clarify certain points for them. Most of them were pretty straight forward and easy to answer, since most of the factual knowledge in the article is based on the research I have carried out and published over the last 15 years. Actually, I had offered NGM such an article twice, once in 2006 and again in 2009, but I never heard back for both story proposals. Anyway, I was very honored that NGM requested to use my Yartsa Gunbu distribution map as the base for their map. Not surprisingly they have created a much nicer version than I have produced so far. Furthermore, I was in close collaboration with the beautiful design of the life cycle graphic. I have already integrated both graphics into my Cordyceps presentations. Last but not least, I got quoted in the context of Yartsa collection and sustainable management, currently my main concern regarding the Yartsa Gunbu phenomenon. Overall the article is very informative in regard to the collection and role of Yartsa Gunbu in current Tibetan society as well as its trade in Tibet and beyond, including its use in China. However, the section on its medical uses falls short. Finkel presents the usual spin that there are no proven medical benefits to Cordyceps, probably on the assumption that the readers want to hear that everyone consuming Yartsa gunbu is just crazy and the Tibetans laugh all the way to the bank. It would have been appropriate to dig a bit deeper into the medical Cordyceps research. The U.S. National Library of Medicine’s Pubmed webpage lists for Cordyceps over 700 medical research papers. Each year there are dozens of papers published especially in East Asia. Or what about just a short reference to the Nottingham University study (Wong et al. 2010) that demonstrated how Cordycepin stops cancer cell reproduction, even if it is not proven by clinical trial yet to actually work as a cancer remedy? And just a few months after the article was published National Geographic News published a Cordyceps article by Nicholas Mott entitled: "Caterpillar Fungus Has Anti-Inflammatory Properties - Tibetan spore could lead to new drugs for cancer, asthma, and diabetes" based on another study (Kondrashov et al. 2012) lead by Cornelia de Moor from Nottingham University. In short, there is a plethora of material available to report on Cordyceps and its medicinal potential in a different tone. Moreover, the author’s attempt to leave a bit of dignity to Yartsa Gunbu users by integrating a story on a Chinese cancer patient that felt much better using Yartsa gunbu failed completely. I have no issue with anecdotal evidence - a friend’s healing experience means more to me than a mere statistic. However, using anecdotal evidence in this article was completely upended by the epilogue that the Chinese cancer patient had died just before the article was published. I argued in favor of two editorial inputs which were accepted. This really made me happy. One was the use of the proper Tibetan name for caterpillar fungus “Yartsa gunbu”, a name I have been championing since my first publication on Yartsa gunbu in 2003. I could make the case that it is preferable to stick with the name already published in the 15th Century by Zurkhar Nyamnyi Dorje, a Tibetan doctor who praised Caterpillar Fungus as a superior aphrodisiac (Winkler 2008). Actually when I shared the Tibetan text for translation with my twin brother Jakob, who is a tibetologist, I was hoping to find a source not focusing on the aphrodisiac theme, but that was what Nyamnyi Dorje focused on. The other suggestion NGM accepted was regarding the source region. Originally NGM was going to report that 96.5% of all Yartsa gunbu is produced in China. Although these were my own numbers and it is a correct statement, I pointed out that probably 95% of harvest is from areas designated as autonomous Tibetan areas in China, such as Tibet Autonomous Region (TAR), and the Tibetan Autonomous Prefectures (TAP) located within Sichuan, Qinghai, Yunnan and Gansu Provinces. Together these autonomous prefectures outside of TAR encompass nearly two thirds of the Tibetan cultural area and the Tibetan population. And nearly all of these areas have Yartsa gunbu resources. The Tibetan areas in Qinghai alone harvest annually more Yartsa gunbu than Tibet AR. Strangely the author uses Chinese names for all the Tibetan collectors and dealers he interviewed and writes about. The original Tibetan name got mangled beyond recognition for any western reader. How is one to recognize Chinese “Silang” for Tibetan “Sonam”? I thought it could be Tsering - Chinese often turn an “R” into an “L”. Anyway, Sonam has been used in English for centuries already; it is as common a name as Sam in English. For example, there is the 3rd Dalai Lama Sonam Gyatso, the 2nd Panchen Lama Sonam Choklang and the list goes on and on. Doing field work on Yartsa gunbu since the late 90s I can not help myself and have to analyze the prices reported in the article. Price development of Yartsa gunbu is a very intriguing subject, basically prices went up over 1000% since I am researching Yartsa gunbu, but the 2008 global financial crisis really made a dent in the steady increase and the market has been less bullish. However, two consecutive poor harvests due to dry winters have driven prices up in 2012. As most popular articles on Yartsa gunbu, the NGM article focuses on the highest prices achieved for the precious fungus, however it is mentioned that “Silang and Yangjin”, two collectors the author followed around in Serxu (= Tibetan: Sershul, Chinese: Shiqu), a county in the west of Sichuan’s Garze (= Tibetan: Kandze, Chinese: Ganzi) TAP, received 580 Yuan or $90 for 30 Yartsa pieces, which amounts to 20 Yuan or $3 per piece, contradicting earlier statements. In the intro image a subtitle reads: "Some go for $20 (120 Yuan) apiece". Early on in the text it is stated it commands twice the price of gold in a fancy shop in China, which would indicate a price of $26,500 or 167,000 Yuan per pound and translates to about 210 Yuan per specimen. In the final double page photo of the article it is stated "For 1500 high-quality worms - that's about two pounds - the firm could reap $100,000". Well, we are not just talking high-quality, 750 Yartsa gunbu per pound is the highest quality, they hardly come any bigger than that! And size does matters in the caterpillar fungus trade, I like to speculate there is a connection to its use as an aphrodisiac. Actually, this late May I saw a display of Yartsa gunbu, which is known in China as Chong cao, in the same store claiming it only required 600 pices to weigh in at one meteric pound. I never saw anywhere such an exceptional size class before, just as I never seen the price class before (So far I do not spend time searching for high end stores in Beijing or Shanghai). Zhong Shi Chong Cao Store charged 740,000 Yuan which equals US$ 118,800! Interestingly the store depicted in the article is the same I have been visiting during my MushRoaming Cordyceps Expedition for several years now. I posted basically the same picture of young Chinese clerks bundling caterpillar fungus on my webpages since two years (see also photo below). There is clearly no copyright on photo ideas, and how does the saying go? "Imitation is the sincerest form of flattery". Towards the end of the article myco-visionary Paul Stamets was quoted as saying "People could be poisoned" from eating wild-crafted Caterpillar Fungus, "for inexperienced it is a form of Russian roulette". I could neither believe that Paul is still claiming this, nor that NGM printed this claim. For starters, Paul's company Fungi Perfecti is selling artificially grown Cordyceps mycelium. Some people would call that a clear conflict of interest. I see no conflict of interest in Paul's absurd statement, as he was being a good businessman, trying to sell his product. However, NGM publishing this seems very odd. As wild caterpillar fungus is a cherished status symbol, which rich and powerful Chinese love to consume. We would hear right away in the media if they were being poisoned by the natural fungus-larva complex. Not a single story surfaced in the last 15 years regarding a Cordyceps poisoning. The only thing that keeps being repeated is a case many, many years ago when some ‘creative’ back country dealer inserted lead wire into caterpillar fungus to add some weight. That scared the whole industry and the big brokers now use x-ray machines to make sure this will not happen again. Or maybe Paul in his visionary capacity foresaw the news published in The New York Times (October 12, 2012). Gu Kailai, the murderous wife of disgraced Chongqing communist party star Bo Xilai was allegedly ingesting mercury and lead-laced Yartsa gunbu pills, but luckily realized early enough she was being poisoned and thus survived the poison attack! My recommendation: Stay away from pills! It is best to stick to consuming the natural thing if you can afford it and do look for a less dysfunctional family. Overall, I was very pleased to see National Geographic Magazine finally dedicating a full story to the Yartsa gunbu phenomenon. There is no other cash crop on this globe that is generating such substantial income for an otherwise marginalized local people. For better or worse, there is no other rural economy that has been pushed from subsistence production to a cash economy relying on a traditional resource in such a short period. Of course such changes cause a lot of challenges to any community and it will be interesting to follow the changes and how the communities will fare. Above all, it is crucial to secure sustainable management approaches, something badly neglected so far. Picked for centuries, Yartsa gunbu seems quite resilient, but the current onslaught is unparalleled. To quote the NGM article: “To harvest the worms sustainably, pickers would need to leave some stalks in the soil to mature and infect the next season’s larvae, says ecologist Daniel Winkler”. Finkel, Michael: Tibetan Gold - A medicinal fungus highly prized in Chinais fueling a boom on the Tibetan Plateau (Photographs by Michael Yamashita). National Geographic Magazine. August 2012: 114-129. Mott, Nicholas 2012. Caterpillar Fungus Has Anti-Inflammatory Properties - Tibetan spore could lead to new drugs for cancer, asthma, and diabetes. National Geographic News Nov 28, 2012. Winkler, D. 2008. The Mushrooming Fungi Market in Tibetexemplified by Cordyceps sinensis and Tricholoma matsutake. Proc. 11th Seminar of International Association for Tibetan Studies, Bonn 2006. Editors Kenneth Bauer, Geoff Childs, Andrew Fischer & Daniel Winkler. In: Journal of the Intern. Assoc. Tibetan Studies / JIATS 4: 1-47. Wong, Edward: New Details of How Wife of Chinese Politician Thought She Was Poisoned. New York Times. Oct. 12, 2012. Wong YY, Moon A, Duffin R, Barthet-Barateig A, Meijer HA, Clemens MJ, de Moor CH. 2010: Cordycepin Inhibits Protein Synthesis and Cell Adhesion through Effects on Signal Transduction. Journal of Biological Chemistry 285.4: 2610–2621. Cordyceps being bundled in a Cordyceps store in Chengdu's He Hua Chi Market. Photo Daniel Winkler, May 2010. Online since June 2010 at the Cordyceps 2010 tour report photo pages.